I have made headway into Richard Sharp’s The Duke Don’t Dance, a story that traces what he calls “The Silent Generation” through the interconnected stories of seven very different protagonists…an excellent character-driven narrative, so far. Book Expo America is right around the corner, and I’ve been pouring over the list of author signings but have only found two historical fiction books that I’d like to eventually review. Both, however, look to me like the kind of mouth-watering epic tales that HF lovers crave. I can’t access the Publisher’s Weekly “galleys to grab” article, so I don’t know what HF galleys are being touted this year–if anyone sees HF novels that would be of interest, please let me know. I’ll be posting updates from BEA, but before that will be the review of The Duke Don’t Dance, by the end of the month. Synopsis fro m Amazon: Fourteen-year-old Carsie Akselrod and her younger sister, Lilia, flee the Russian pogroms to live with relatives on New York’s teeming, dangerous Lower East Side. Like many Jewish immigrant Americans in the early 1900s, the girls go to work in sweatshops, eventually taking jobs at the ill-fated Triangle Waist Company, scene of the infamous 1911 industrial fire that claimed the lives of 146 garment workers. Set against Tammany Hall politics and gangland crime, City of Slaughter is a tale of a woman torn by family, faith, and her drive to rise from poverty, succeed in business, and claim her place in New York’s world of fashion and society. Synopsis from Amazon: Orphaned when his mother dies of starvation, having been cast out of her village as a witch, John is taken in at the kitchens at Buckland Manor, where he quickly rises from kitchen-boy to Cook, and is known for his uniquely keen palate and natural cooking ability. However, he quickly gets on the wrong side of Lady Lucretia, the aristocratic daughter of the Lord of the Manor. In order to inherit the estate, Lucretia must wed, but her fiancé is an arrogant buffoon. 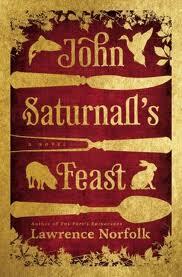 When Lucretia takes on a vow of hunger until her father calls off her engagement to her insipid husband-to-be, it falls to John to try to cook her delicious foods that might tempt her to break her fast. I have these on my list too! I’m planning on posting a BEA Galleys to Grab note on my site this weekend – focusing on historicals, of course. PW lists some in their article, but not many.